Throughout the 20 centuries since Jesus Life on this earth, there have been many practices within the church that today seem not only strange but downright bizarre. One of the more unusual ways in which an individual demonstrated their devotion to the holy life is the life of the anchor. The life of an anchor (or anchoress in the case of women, which make up the vast majority of the these religious) was an ascetic life, shut off from the world inside a small room, usually built onto a church so that they could follow the services. Most often there was only a small window acting as their link to the outside world, through which food would be passed in and refuse taken out. Most of the anchor's life would be spent in prayer, contemplation, or solitary handworking activities, like stitching and embroidering, or the copying of manuscripts. As a symbol of the fact they considered themselves dead to the world, they would actually be given the last rites from the bishop before their confinement in the anchorage. This was done in a complete burial ceremony with the anchor laid out on a bier. One of the most famous of these, was a 12th century anchoress named Jutta, attached to the church of a Benedictine monastery at Disibodenberg in Germany. Jutta's fame was such that she was often consulted by many people, religious and non-religious alike, because of her wisdom and understanding. For this reason too, local nobles would send their children to her for religious instruction. One such child was Hildegard. Born in 1098, the 10th child of a noble family, Hildegard was tithed to the Lord according to the custom of the day, and dedicated by her parents to the religious life. Her education under Jutta, starting at the age of 8, would have been very rudimentary. She would have learned to read Latin so that she would be able to read the scriptures and her daily prayers, but not to write it. There would have been no math, no science and only the history of the saints would have been deemed necessary for the life she was destined to live. Her proximity to the church as astudent of the anchoress, would also have given her exposure to the musical aspects of the worship services held there, but it is unlikely she received any formal training. When she reached the age of maturity, likely 14 or 15, she formally became a nun and entered into the religious life for herself. Hildegard applied herself to her duties diligently, and for all outward appearances was no different from any other nun in convent. But she was not like all the other nuns, for Hildegard had a secret. From the age of three Hildegard had been seeing visions. Visions of Jesus, and of heaven, and of things she would have no names for until she was much older. She learned quickly that others did not see the things she saw, and fearing this difference in her, she kept them a secret; from everyone except Jutta. Jutta thought the bishop should know of Hildegard's gift, but kept young nun's secret until her death in 1136. By this time Hildegard was approaching her 40s and had been appointed Superior of the Benedictine convent to which she had been assigned. It was also at this time that the inner voice that accompanied her visions told her to reveal what she had seen to the world. After resisting for some time, (until the headaches that resulted from resistance became too much to bear) she eventually told all to her spiritual director, the abbot of the monastery. Immediately an investigation was launched into the alleged visions; but after extensive interviews with representatives of the bishop, her visions were declared to be genuine, and a monk was instructed to aid Hildegard in the publishing of her revelations. The result was three books, containing visions of heaven and the future, along with admonitions to the church and the world for straying from the path of righteousness. Hildegard was always plagued by feelings of inadequacy and sought time and tim e again permission from her superiors to continue her work, fearing that one day the decision would be made that her visions were, in fact, invalid. Finally, when she wrote to Saint Bernard seeking permission once again, he brought the matter to the attention of Pope Eugenius, who exhorted Hildegard to complete the recording of her visions, that all the world might benefit. With papal imprimatur (a scared imperative, not to be denied) in hand, Hildegard finished her visionary work called Scivias ("Know the Ways of the Lord") and her fame began to spread throughout Germany and beyond. Pictured at right is an illustration of Hildegard from a work honoring her after her death. The lines above her head represent rays of light that Hildegard credited as the source of her visions, which she described as, "a fiery light of exceeding brilliance came and permeated my whole brain, and inflamed my whole heart and my whole breast, not like a burning but a warming flame, as the sun warms anything its rays touch." It has been suggested that this description also resembles those given by sufferers of migraines. It was in the last year of her life that Hildegard faced what some consider to be her greatest trial. The local ecclesiastical authorities demanded that she have the body of a young man, who had once been under excommunication, removed from the cemetery attached to her convent. She argued that since the man had received the last sacraments and was therefore reconciled to the church, she was under no obligation to obey. So great was the respect for this woman that, after some correspondence, her decision was supported and the interdict against her convent was removed. Later that year she died peacefully and was buried in the church of Rupertsberg. Though never formally canonized, Hildegard of Bingen, is universally referred to as St. Hildegard and is celebrated throughout Europe. She died at the age of 82, in the convent she founded, on September 17th, 1179 - 828 years ago this week. 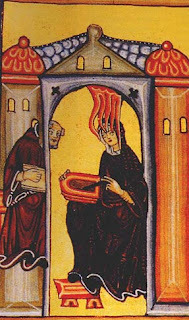 1: "Saint Hildegard", New Advent Catholic Encyclopedia, <http://www.newadvent.org/cathen/07351a.htm>. 2. "Hildegard, Saint." Encyclopædia Britannica Online. 2007 <http://www.britannica.com/eb/article-9040445>. 3: various other internet articles. Photo Credit: The image is in the public domain. September 15, 1648: - The Larger and the Shorter Catechisms of Westminster, now used by Presbyterian, Congregationalist, and Baptist congregations to define the basic tenants of the Christian faith, are approved by the British Parliament. September 16, 1498: - Tomas de Torquemada, a converted Jew who becomes the dominant force behind the Spanish Inquisition and its first Inquisitor General, dies at the age of 78. During his tenure he burned over 2,000 victims and tortured thousands more. It is reported that as many as 40 percent of those accused had no idea what they we being accused of or why. Many confessed to crimes of which they had no knowledge, just to end the torture. September 18, 1924: - James Moffatt, a Scottish Presbyterian issued A New Translation of the Bible Containing the Old and New Testaments which he had produced on his own. It was to be the first of many translations that would be made for general readers in the twentieth century; however, by today's standard's it would be regarded more as a paraphrase edition due to many passages that Moffat 'interpreted' based on his own understanding of Christian doctrine. September 19, 1955: - Mission Aviation pilot Nate Saint spots the Auca villages in the Amazon jungle. The Auca would later massacre him and his companions on January 6, 1956. September 20, 1224: - On or about this date, on Italy's secluded Mount Alvernia, Francis of Assisi is reported to have prayed, "O Lord, I beg of you two graces before I die—to experience in myself in all possible fullness the pains of your cruel passion, and to feel for you the same love that made you sacrifice yourself for us." St. Francis recounted that not long thereafter his "heart was filled with both joy and pity", and wounds appeared on his hands, feet, and side (called stigmata) which witnesses testified he carried until his death in 1226. September 21, 1522: - The first edition of Martin Luther's German translation of the New Testament is published. It would be on this same that date, 36 years later, in 1558 that Charles V, Holy Roman Emperor, who called the Diet of Worms which condemned Martin Luther, would die. I really appreciate this posting - as I do all of your postings. Keep up the excellent work!